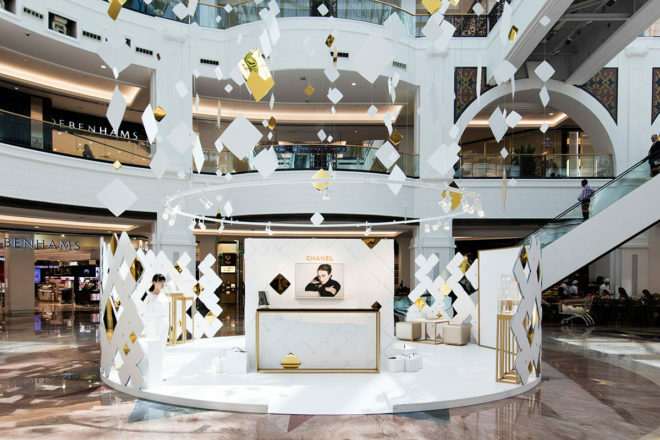 CHANEL Fine Jewellery unveiled their newest pop-up at the bustling Mall of the Emirates. The podium showcased pieces from their Coco Crush collection, from rings to cuff bracelets and necklace pendants. Our team had to incorporate the ‘Matelassé’ quilted pattern as the main inspiration for the bespoke stand. We produced this effect with 2 layers of aluminium in both white matt & gold acrylic finishes. The full booth was adorned with 400 hanging items, suspended from the Mall ceiling at 40m high. Added to that, we also produced a photo-booth room, as well as tailored furniture and jewellery showcases allowing the customers to get up-close to the display.